This is our official list in search of the best electric blanket on the market today. Scroll further down for full details on each product and a brief overview of electric blankets. Electric blankets allow us to sleep at a comfortable temperature without using extra layers or turning up the heater. These blankets are designed to ensure that you sleep in the right temperature. After significant research, here are the top five choices. The Soft Heat Luxury Micro-Fleece Electric Blanket is made from the softest plush fabric, and packs many high-end features, but without the higher price. Made from 100% Polyester fabric this blanket is washable & dyer-safe without any pilling, shrinking or stretching. This blanket has evenly spaced thin wires at 3-inch intervals to provide even heat with no cool or hot spots. In fact, the blanket is cool to the touch but provides safe low-voltage warmth even if the blanket were to become wet accidentally. Use the pre-heat feature and you get your entire bed warm before you jump into your bed for the night. Pre-heating can even be adjusted for individual preferences. The is electric blanket provide warmth and safety. The integrated overheating protection keeps you and your pets safe. The automatically shuts off after 10 hours for convenience, safety, and energy savings. Sunbeam Quilted Fleece Heated Blanket is a modern electric blanket that is also made of 100% polyester with a 160 GSM per side rating. It has a dual control system that allows partners to each select their own heating preference. Because of the quilted design, it can preserve warmth for hours even after shutting it off. The quilted design also allows it to blend in easily with other blankets on the bed. Remember with an overall GSM rating of 320, 160 per side, the Sunbeam Quilted Fleece Heated Blanket should provide decent insulation even without electrical power. This electric blanket is machine washable and safe for use in the dryer. The quilted chamber design is impressive. It allows it to blend aesthetically with other bedding while also helping to keep you warmer. The Soft Heat Ultra Micro-Plush Low-Voltage Electric Blanket comes in a super soft triple rib material. The fabric feels like any other blanket; the manufacturers claim you will not feel the wire are true. This electric blanket has all the features you want in a low voltage set up. What exactly is a low voltage electric blanket? Basically, it converts the 120-volt AC of your home’s current into a non-hazardous low voltage DC current. The low voltage rate is also good for pets and will allow the blanket to operate safely even if exposed to water. This is a safer option for customers who are worried about long-term exposure to electromagnetic fields or EMFs. But what about the wires? At 3-inch intervals, these are evenly spaced and thin to provide even heat with no cool or hot spots, but you will not feel them. Surprisingly, the blanket is cool to the touch even but provides heat that is felt throughout the night. The dual controllers work for separate zones and are available for the queen and king sizes. A large backlit display that has auto-dimming provides convenience for night time adjustments. If you forget to turn off your blanket in the morning, don’t worry it automatically shuts off after 10 hours. This electric blanket feels just like a regular blanket, and not like the old bulky and stiff electric blankets of past. The controller and options are well thought out and provide you with all the features you will want. Two separate outlets are needed for the controls. 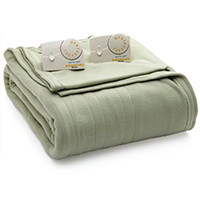 Biddeford Comfort Knit Heated Blanket has the softest fabric that is also lightweight. The color blends easily with any room and comes in your choice of colors cloud blue, sage fawn, and natural. Heat is felt throughout the blanket evenly with no cold spots. This electric blanket differs from others with the large dual analog controllers for sizes queen and up. These controllers turn easily with a large dial, and when you are sleepy or even if you wear glasses, fussing with numbers on a display can be a nightmare. Nothing could be simple than turning an analog controller. The main power supply and hardwired dual controllers have very extra-long cords to help you reach your outlets with ease. The wires may be thicker than other models, but they are durable yet flexible. Rest assured that this blanket not only feels soft with its knit design but is durable too. The comfort knit heated blanket is described as machine washable, but there are no recommendations for use in a machine dryer. Otherwise, you will have a wonderful electric blanket with settings and the standard 10-hour automation shut-off feature you come to expect in modern designs. The Biddeford luxuriously soft micro plush Sherpa heated blanket is amazing to cuddle up in when you get cold. Customers can’t stop raving about how much they love this electric blanket. It is 100% polyester with the highest quality micro plush top, and real Sherpa bottom cradles you in its softness. It hardly feels like an electric blanket. It blends in with any room and surroundings easily. The digital controller features 10 personal heat settings and an automatic shutoff that turns the blanket off after 10 hours. Dual controllers for sizes queen and above provide even more customizations. The Biddeford luxuriously soft micro plush Sherpa heated blanket combines luxury and comfort. The soft feel and warmth will have you wondering how did you every sleep without one before. Don’t forget that these also make great gifts to others. Safety and maintenance issues of the past have given electric blankets a mixed reputation. In response, blankets now offer low-voltage regulators, dual controls, thermostats, and machine washable. Today’s electric blankets are made of thick fleece, quilted materials, and other quality materials. They have many features and options. To find the right electric blanket important considerations need to be taken into account, and we will cover those below. Modern electric blanket manufacturers address concerns about the safety and durability of their products. Many have incorporated automatic temperature controls to prevent accidental overheating. Improved wiring technology is used to eliminate potential shock hazards. Automatic shutoffs, improved connectors, and low voltage features bring electric blankets to the 21st century. Adjusting the temperature in the middle of the night half asleep can be difficult. You will want the controls to be intuitive and within reach. The choice between digital controls, analog dials, and even wireless controls must be made. Regardless of the technology be sure to look for a large easy-to-turn and easy-to-grasp knobs or control buttons. Purchase a control with large bright numbers on the setting dial or those with backlit display. Many couples prefer sleeping at a different temperature. Some prefer to be hotter or cooler, or maybe just want warmth on their feet. Dual controls offer a solution for this by allowing each person to adjust the heat on one side of the bed or even individual zones. A nice feature that you will find with some blanket controls is a preheat feature that can be adjustable. You will never jump into a cold bed again. Enjoy having this feature and fall quicker into a comfortable slumber. Look for electric blankets with an automatic shut off or timers. This allows you to fall asleep safely with the blanket still on and once asleep it will shut off. Ten hours is standard time but some electric blankets offer more shut-off time options. The thought of machine washing or drying an electric was considered an untimely end to many in the past. However, today you will find electric blanket being laundered in the same loads as sheets and pillow cases. Ease of care is important when looking each product’s durability and comfort. Most electric blankets have power cords that attach at the foot of the bed and the controls that stretch up to the head of the bed. Check to see if the blankets cords will be long enough to reach a power outlet. If not, you may need to rearrange your furniture as most manufacturers recommend for safety reasons that you do not use extension cords. Extension cords and power supplies can be fire hazards so be cautious. Do You Have Pets That Sleep in Bed with You? If you do sleep with a pet be careful that the electric blanket you choose does not pose a hazard to your pet. Most experts suggest a low-voltage electric blanket, this minimizes the risk of electric shock. These can withstand an incontinent pet, and also help to regulate a lower steady temperature that is safer for your pets. Also look for stain proof to help with dirty paws and whatever else your pet might bring into your bed. An electric blanket’s GSM rating is similar to a bed sheet thread count. It is another important consideration to keep in mind when looking at different styles. The higher the count, the heavier the weight of the fabric. The best electric blanket will have all the features you want and meet your personal needs. Everyone has different desires, some will find the low voltage lower constant heat is perfect for them. Others will enjoy the variable heat with specialized zone settings. Regardless of your personal heating preferences remember that even the best electric blankets will not last forever. Pick one that has a longer warranty or the features you really want within your budget. Take care in choosing the features like timers and dual controls, make sure you can use them with ease, asleep or awake. Enjoy being warm any time of year and whenever you wish with your new warm snuggly electric blanket.